In the late 1940s and early 1950s Dean Martin and Jerry Lewis created some of the most irresistible hilarity in the history of entertainment. 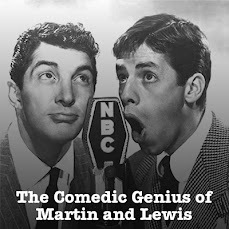 Now you can enjoy the Martin and Lewis Show, which aired on NBC Radio from 1949 through 1953. Listen in to the Podcast, and find out what all the fuss was about! For the first post to this Weblog, I can think of nothing better than a short video of the boys wreaking havoc on The Colgate Comedy Show when they had five minutes to fill. Enjoy! I have a boxed set of these Colgate Comedy Hour DVDs. They are incredible. Thank goodness they exist.